LT Decor – Premium Interior Decorating website template is a high-quality online magazine with beautiful appearance for home decor with Interior Decorating website template. It is an attractive Interior Decorating Website template that has a unique design for kinds of home decor online magazines as well as any other relating kinds online newspapers. This theme has been prepared with high-quality photos, beautiful sliders in eye-catching effects, great content organization, and more, so it is easy to catch visitors attentions and keep them stay on your site longer. LT Decor comes with Page Builder for layout, Shortcode to edit content quickly, Support Font Awesome, Compress files, and also a fully responsive layout to make your site look perfectly on any kinds of mobile device, modern and stylish. 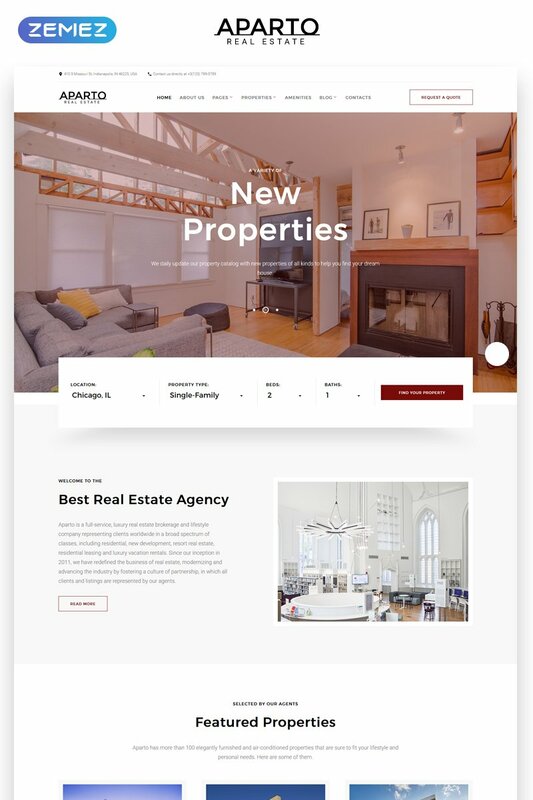 Aparto – Real Estate Multipage HTML Website Template is a comprehensive multipage HTML template that is best suited to be used for real estate, design, and furniture sites. If you want to build a successful site that will run smoothly in all web environments, you have to work with a robust and fully-fledged theme, supporting specific functionality. When properly designed, your site can give an impressive ROI. It has a powerful admin panel that allows working with any element of the design, including colors, fonts, backgrounds, structure, etc. Interior Decor – Multipage HTML5 Website Template has a thematic design and cross-browser support. The template was created using HTML5 and CSS3. Graphic elements offer many options for decorating your future website. This template can be used by interior design studios of any kind. The solution gives unlimited possibilities to its owner. It allows you to choose from a wide range of ready-made styles of headers and footers. Or to simply create your own variations. Clark Exterior Design Responsive Website Template is the best way of starting an exterior design company website. We offer an easy on the eyes design that has a highly distinct visual style. Our wonderful responsive design is available on every known device and all around the world. Want to write a statement to your online visitors? You can always write using the personal blog. Elegant and refined style of this Interior & Furniture Responsive Website Template is enhanced with bold visuals featured in the backgrounds and content blocks. Stunning animation and parallax scrolling effect make the layout more visually impressive. A card-based content positioning provides for better scannability of your data. Fully integrated with social media options, the theme provides the users with quick access to your social media profiles. Google map widget is integrated into the footer area. Accompanied with contract details and live chat functionality, it lets the users get in touch with you in a variety of ways. How to be on track in today`s marketing warfare? If you’re the wolf of Wall Street a.k.a Interior & Furniture website owner, you’ll be amazed by this Interior Site Template. Blog highlights, located on the home page, can be an interactive tweak to catch visitors` attention. Navigation was made intuitive with live search and dropdown menu. Avoid stressful scrolling back and forth with the help of stick to top menu and back to top button. Have a question? Feel free to contact our support team, available 24/7. Build strong online presence with this template! Better Furniture Manufacturing is a responsive one-page Website template tailored for interior design sites. Different content blocks of this Furniture Factory Site Template are presented on easy on the eyes backgrounds. To show up your products, there is a minimalist image gallery. Delicate and attractive design with elegant animation will appeal to the audience that appreciates courtly style in design. Blog helps to keep a close eye on latest news and features. The template also comes with multiple widgets and navigation options . For example, Google map will show the shortest route to your exact location. Dropdown Menu will enhance the search of the necessary content.